Eurostat performs data validation by verifying whether data are in accordance with certain basic criteria that serve to assess the plausibility of the given data. In this context, the following specific definition is applicable: Data validation is an activity verifying whether or not a combination of values is a member of a set of acceptable combinations. Data validation is a key task performed in all statistical domains. In order to increase overall data quality and workflow efficiency, the European Statistical System (ESS) is moving towards more harmonised validation activities. 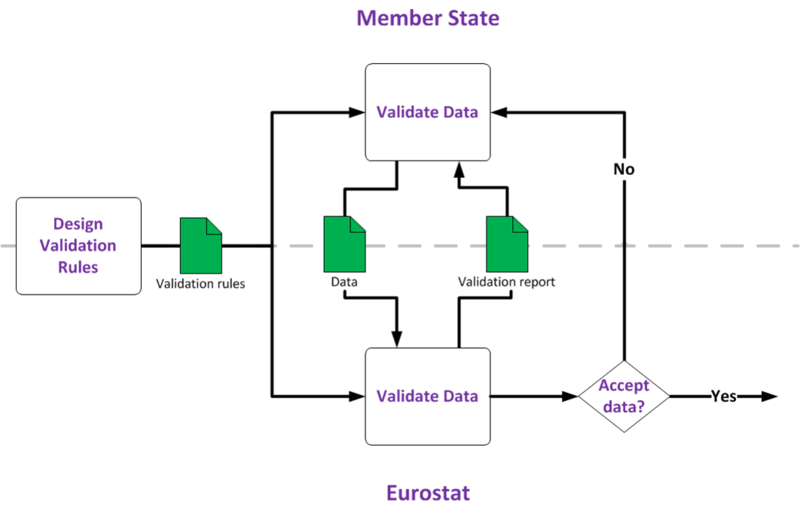 Eurostat supports the effort towards more integration by defining common standards for validation, providing common validation tools or services to be used by the ESS, and providing statistical, methodological, administrative and technical support. In the target business process, validation rules are jointly designed and agreed upon at the level of each statistical domain’s Working Group. The resulting validation rules are documented using common cross-domain standards, with clear validation responsibilities assigned to the different groups participating in the production process of European statistics. Further information - information related to other data validation related content. See also: Video presentation on ESS Validation.